Small business owners are always short on time when it comes to updating their website and keeping it modern, with fresh content and secure for customers. At TGS Web Design we understand this problem and want to help lighten the load. We have put together monthly website maintenance plans for any size website to help you keep your website up to date and running smoothly. Our monthly website maintenance plans cover all the details required to keep your website up and running and looking great. Below are some of the details on the website maintenance plans that we offer. What’s Included in the Monthly Maintenance Plan? The Basic Website Maintenance Plan will free you from worry about updating your WordPress installation, and will give you a resource for a few quick questions. 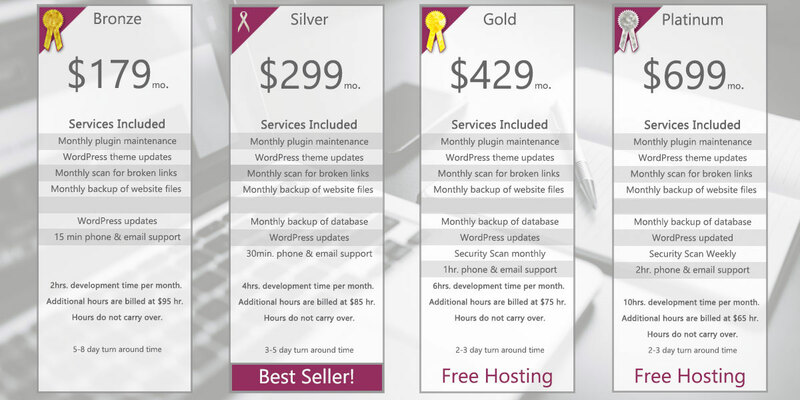 With the Bronze, Silver and Gold Maintenance Plans, you can rest assured that your website will remain up-to-date, PLUS you’ll receive technical support or other site maintenance so you can keep your website in top shape and working as you need it. These plans allow your site to grow and change with your business and make room for ongoing improvements. • Keep your site updated with the latest information. Recovery of hacked websites is not included in our maintenance plans, as websites can be hacked at any time and we do not have control over this. We recommend that you use strong passwords for all WordPress sites and hosting accounts, at all times. If further technical assistance or updates are needed, we are happy to help with that. Just contact us for a quote on the services needed. Payments are debited monthly from the date of sign up via Paypal subscription services. Maintenance plans will run continuously but may be cancelled at any time, with 30 days notice. If it’s not working out for you, no problem! We’re happy to stop the plan when needed, we just ask for a little notice. For more information please fill out the form below with the details of your website project to schedule a no obligation website design consultation. If you are emailing us, please be sure to include your website URL and contact information along with any necessary details about your project that you feel we need to know. Alternatively please feel free to call us at 505-903-4326 or email design@thomasgarciastudio.com We look forward to hearing from you!